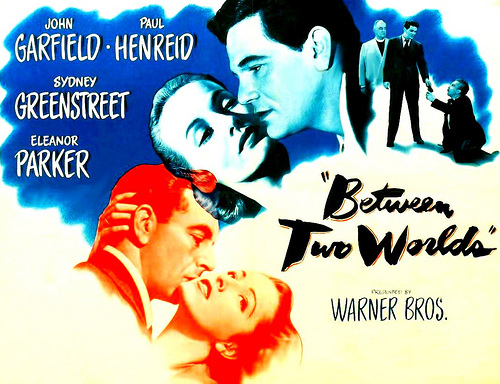 Between Two Worlds is quite a different film from The Thing From Another World. I really enjoy doing these columns and seeing the variety of films that I have enjoyed or, in some cases, not enjoyed. Every now and again I stumble across a film that I have never heard of but catches my interest. This week I had intended to review The Thing From Another World and give some background story about it and me. But after watching it the other night, I decided to go to sleep rather than immediately put my thoughts down on the computer. The next morning I got up and as I scanned the channel guides, I ran across this film Beyond Two Worlds. I read the brief synopsis and looked at the cast. I was sold on it. I was already five minutes into the broadcast, but I figured I could catch up with it pretty fast. I am so glad I did. First let’s look at the cast. The leads are Paul Henreid as Henry Bergner and Eleanor Parker as his wife Anne. That’s a pretty decent start. 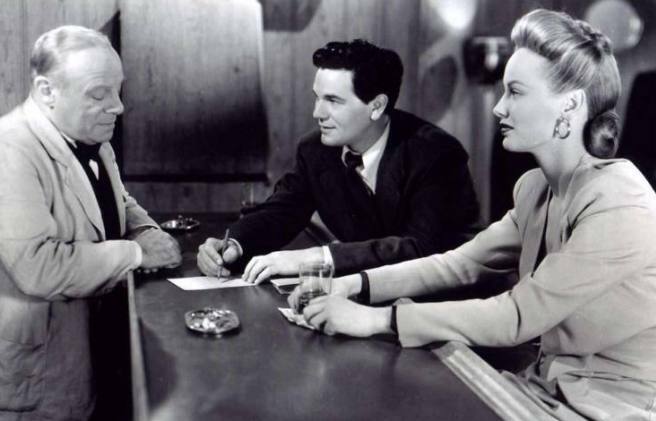 I saw John Garfield listed as Tom Prior, Edmund Gwenn as Scrubby the steward, and Sydney Greenstreet as Tim Thompson. The pairing of Henreid and Greenstreet just a year after Casablanca got my interest up. And there was a score from Eric Wolfgang Korngold, which immediately makes any film worth watching. The characters in Between Two Worlds try to unravel the mystery of how they ended up together on a ship at sea. Henry Bergner is an Austrian pianist turned soldier living in London. His hands are injured and he can no longer play. He and Ann want to get to America but are having trouble securing exit visas. (Where have I heard something like that before?) Distraught, he leaves the diplomatic office and returns home, where he seals the window and plays his favorite record. Ann has missed Henry at the office but sees a group of people getting their documents and leaving. As they leave, there is an air raid and the fleeing car suffers a direct hit. Everyone is killed instantly. She returns to their flat to find Henry in the act of suicide and refuses to leave him. They drift off. Suddenly they are on a large ship with a group of people, mingling in the bar. They don’t recall how they got there nor does anyone else. The friendly steward helps people with drinks and conversation. The film sort of becomes a Grant Hotel at sea. You have the business executive Mr. Lingley (George Coulouris), the minister (Dennis King), the upper class couple who don’t know why they have to associate with the riffraff (Isobel Elson and Gilbert Emory), the journalist (Garfield), the actress (Faye Emerson), the housekeeper (Sara Allgood) and the sailor (George Tobias). Eventually, Ann realizes that she has seen these people before. They were the ones in the vehicle hit by the bomb. Suddenly both she and Henry remember that they were in the process of dying just moments earlier. They are on a ship between two worlds – sailing to Heaven and to Hell. They realize that none of the others knows what is happening. The steward asks them to let everyone relax and enjoy the ride for the moment and not bring it up their conclusion. But there is tension in the room. Prior, the journalist is washed up and unemployed, partly due to a series of articles he did on Lingley, who is a capitalist at all costs and could be a President of the I’m for Me First party. He gets what he wants no matter what the cost. The Reverend is off on a trip to begin a new series of work for the betterment of his church. The actress is hanging with Prior, but Lingley is making a play. The sailor has just gotten word that he has become a new father. He’s heading home after having three ships torpedoed beneath him. Prior overhears Henry and Ann and tells everyone that they are dead. The steward reluctantly confirms this. When asked what happens next, he tells everyone that some the Examiner will be there to… examine them. The Examiner turns out to be the Reverent Tim Thompson, an old colleague of the minister. Together they examine each of the passengers one at a time to determine their final destination. I’m not going to go into the further details, but it goes much as you would expect, until it comes down to Henry and Ann, who are the last to be examined. As a suicide, Henry presents a problem to them. Heaven is not his destination, but it is for Ann who did not actively pursue that course. I thought this was a fine film. Apparently it is based on a 1924 play titled Outward Bound, which starred Leslie Howard. It was filmed in 1930. In the original play and film version, the audience did not know the passengers were dead until the end of the performance. Leonard Maltin in his Movie Guide liked Outward Bound better than Between Two Worlds. I will have to be on the lookout for that one now. So I’ll be back next week with The Thing From Another World, unless fate intervenes. This entry was posted in Forgotten Movie, Movies and tagged Between Two Worlds, Edmund Gwenn, Eleanor Parker, Eric Wolfgang Korngold, John Garfield, Outward Bound, Paul Henreid, Sydney Greenstreet, The Thing, The Thing From Another World by sanford. Bookmark the permalink. I loved this movie. The “upper class” couple, Edmund Gwenn, Sara Allgood and Faye Emerson are standouts. Sidney Greenstreet, ditto. All the actors are quite good. I have a problem with Garfield, probably because he’s played this character in so many movies.